The Greeks always wanted and will always want relations of friendship and good neighborliness with Turkey, as there are “more things that unite us than divide us,” Greek President Prokopis Pavlopoulos said on Monday in a meeting with Turkish Prime Minister Binali Yildirim in Athens. Yildirim told Pavlopoulos that the Turkish President, Recep Tayyip Erdogan, has asked to visit Greece this year. Pavlopoulos accepted, stressing that it is important the two sides to get well prepared for President Erdogan’s visit so that it will be successful and bring good results.“Greece is Turkey’s doorway and window to Europe,” he said, noting that Greece has always viewed Turkey’s European course positively. He also noted, however, that a country wishing to join the EU must fully respect both international law and the laws of Europe. “We are ready to assist Turkey in this direction when it needs it,” he added, pointing out that peaceful solutions based on international law would greatly assist Turkey’s bilateral relations with Greece and its progress toward EU membership. The Greek side was ready to do its part, he said, and such an approach would greatly lessen the defense costs incurred by both countries at difficult times for their respective economies. “It could well be spent to further enhance the prosperity of our people. It is necessary to do this and on this we are absolutely frank,” he added. Yildirim noted Ankara’s satisfaction with Pavlopoulos’ recent visit to Istanbul, which he said was the first by a Greek president in 65 years. He also agreed with the Greek president that “there are great many issues on which we have a common approach,” in addition to the issues that divide the two countries. “Consequently, I consider that a positive approach on this positive agenda will prove beneficial to both peoples and both countries,” he said. 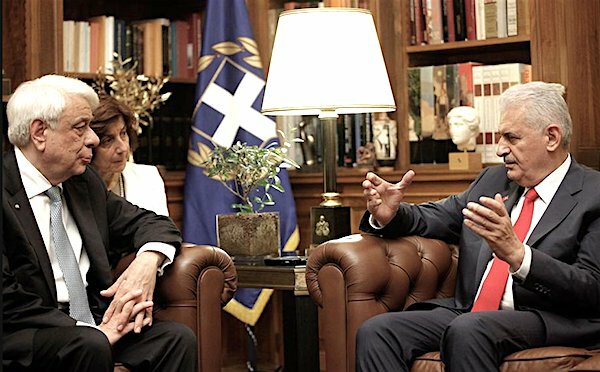 The Turkish government was fully aware of Greece’s contribution to Turkey’s efforts to join the EU, he added, and “very grateful for all you have done.” At the same time, he criticized the EU’s dealings with Turkey over the past year, saying they had not helped the progress of Turkey’s accession efforts. “It would be very good if the EU clearly outlined its vision for the future of Europe and decided what Turkey’s place in that future will be,” he said. “We believe that Turkey’s full EU membership will contribute to the security of the EU and to a climate of security and stability in the broader region. The Turkish premier also highlighted Turkey’s role as a “buffer” for refugee flows to Europe and in fighting terrorism, saying Ankara would like to see recognition and acknowledgement for these efforts, especially as regards the refugee crisis.